Also serving communities of Guthrie. There are 24 Assisted Living Facilities in the Edmond area, with 11 in Edmond and 13 nearby. The average cost of assisted living in Edmond is $3,357 per month. This is higher than the national median of $3,346. Cheaper nearby regions include Bethany with an average starting cost of $2,745. To help you with your search, browse the 235 reviews below for assisted living facilities in Edmond. On average, consumers rate assisted living in Edmond 4.3 out of 5 stars. Better rated regions include Del City with an average rating of 4.8 out of 5 stars. Caring.com has helped 9 families in Edmond find high-quality senior care. To speak with one of our Family Advisors about assisted living options and costs in Edmond, call (855) 863-8283. Edmond, Okla., has often been selected as one of the most outstanding communities in its class by the state Chamber of Commerce and is one of the 10 most affluent cities in Oklahoma. The senior population of 12.9 percent in Edmond has 43 assisted living facilities in this area from which to choose, including 11 in Edmond itself and 32 in nearby areas such as Bethany and Shawnee. 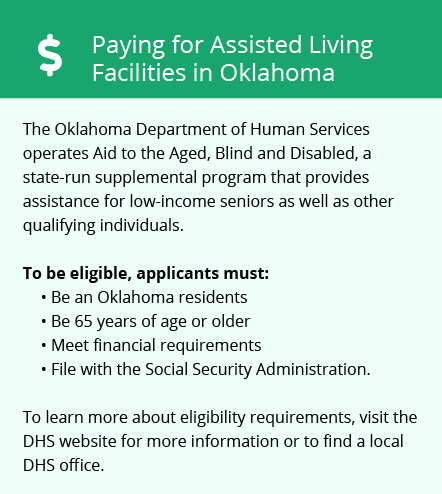 The Oklahoma State Department of Health regulates these facilities for senior citizens, which it describes as assisted living centers (ALCs). Edmond’s location in Central Oklahoma gives it hot summers, with an average high of 95 degrees in July. The weather is more variable during other parts of the year, with an average low of 22 degrees in January. Seniors in Edmond will find that spring and fall are the most comfortable for outdoor activities. The cost of living in Edmond is less than 1 percent above the national average. Groceries are the lowest expense at about 89 percent of the national average, and housing is the highest at 13 percent above the national average. Edmond is safer than 41 percent of cities in the U.S., but it’s much safer than the majority of cities in Oklahoma. The overall crime rate in Edmond is 17.48 crimes per thousand people per year, compared to 34.33 per thousand for Oklahoma. Citylink provides regular public transportation in Edmond except on major holidays. All buses are equipped with tie-downs for wheelchairs and bicycles. All passengers ride for free, including senior citizens, disabled persons and the general public. The Edmond Senior Center provides a wide range of activities for seniors 55 and up, including games, fitness and adult education. This facility also sponsors regular day trips out of the city and special events. The Edmond Senior Center serves lunch Monday through Friday. The Edmond area is home to world-class medical facilities, including INTEGRIS Health Edmond, OU Medical Center and Edmond Specialty Hospital, in the event of medical emergencies or illness. Assisted Living costs in Edmond start around $3,357 per month on average, while the nationwide average cost of assisted living is $4,000 per month, according to the latest figures from Genworth’s Cost of Care Survey. It’s important to note that assisted living rates in Edmond and the surrounding suburbs can vary widely based on factors such as location, the level of care needed, apartment size and the types of amenities offered at each community. 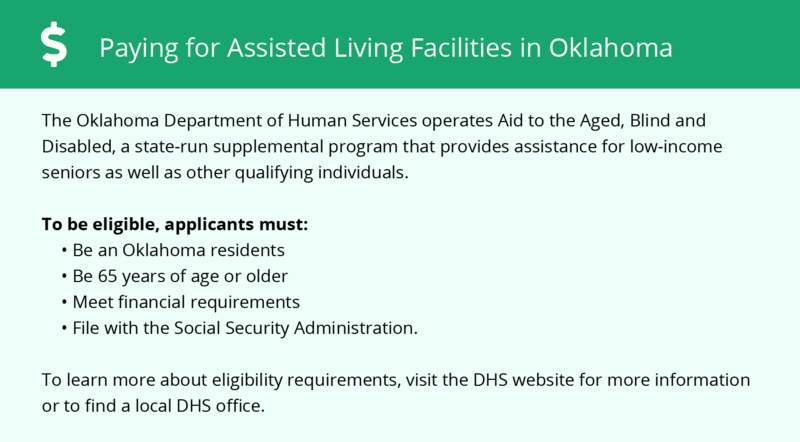 Many Medicaid Waiver programs are available in Oklahoma to provide assistance with assisted living. The OK Sooner Services program will be of greatest interest to senior citizens. It provides beneficiaries to people who are at least 65 years of age with assisted living and related services such as adult day health, personal care and educational services. Edmond and the surrounding area are home to numerous government agencies and non-profit organizations offering help for seniors searching for or currently residing in an assisted living community. These organizations can also provide assistance in a number of other eldercare services such as geriatric care management, elder law advice, estate planning, finding home care and health and wellness programs. To see a list of free assisted living resources in Edmond, please visit our Assisted Living in Oklahoma page. Edmond-area assisted living communities must adhere to the comprehensive set of state laws and regulations that all assisted living communities in Oklahoma are required to follow. Visit our Assisted Living in Oklahoma page for more information about these laws.